Fancy soaps and lotions used to be on par with candles that smelled good and our best towels- don't touch them if you live in our house. However, if you're a guest, by all means enjoy them. It seems silly to save your best things for guests. Sure it's nice to have pretty towels and fancy soaps for visitors but why just them? When did we become not worthy of such nice yet simple indulgences? So I broke that stigma in our house. I bought expensive, handmade soap from a farmer's market while on vacation and we actually used it. In fact, WE LOVED IT! It was an herb filled goat's milk soap. It smelled divine and didn't dry out my skin. I was hooked. Well, the sad news for me was that they didn't ship their soap. So I tried other ones I found on Etsy and nothing compared. I decided to give it a go and make my own. I had a stockpile of various essential oils and a ton of dried herbs. 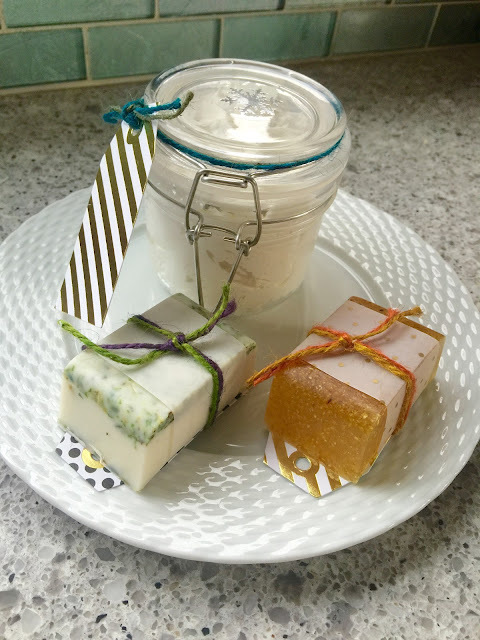 After consulting my hippie-guru friend, I learned that homemade soap could be as simple as melt, stir in whatever you want, and pour it into molds. Seemed way too simple. But I'm always up for a good failure so I tried it anyway. 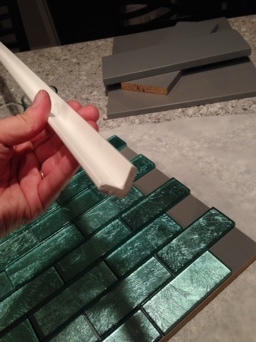 The soap bases I found in local craft and big box stores would be drying- or so I was told- as they didn't contain anything that could moisturize. You *could* add your own and hope for the final product to set up properly. Or you could just buy a superior product to start with. I opted for the latter. I found a company with reasonably priced bases in a managerie of types. Every base had wonderful, raving reviews. 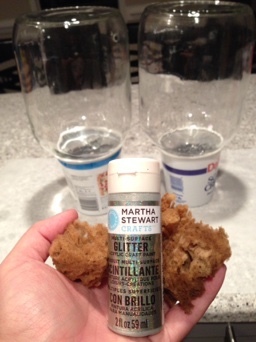 I chose an olive oil glycerine base, and an oatmeal glycerine base. A quick stop back at a craft store stocked me up with glass jars, tags, vellum paper, colored twine, dried lavender flowers, and dried orange peels. After scrounging through my stash of essential oils, I settled on a Rosemary Lavender combo and a Lemon Ginger combo. Since the lavender looked so delicate, I opted to mix that one with the creamy oatmeal base. The orange peels were a nice accompaniment to the golden color of the olive oil base anyway. My kitchen already smelled amazing. Take a bowl, chop your base up a bit to facilitate even melting, and melt at 30 second intervals in the microwave. I've been told it can burn if you try hard enough. I am beyond thrilled to report that I have no idea what that smells like. I can't imagine burnt soap is a pleasant aroma. 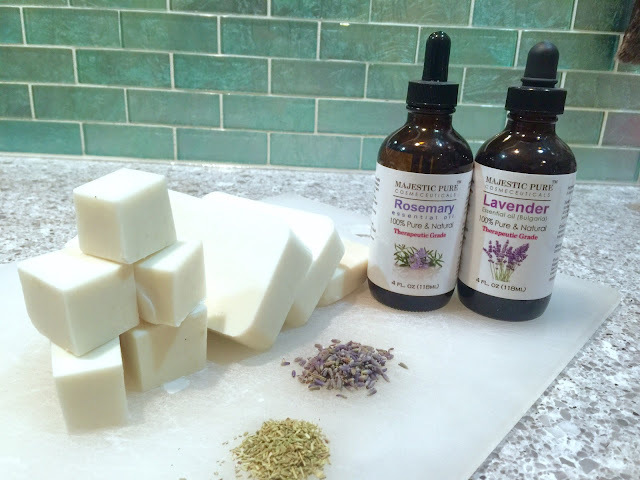 For each pound of soap base, it is recommended to use no more than 5 ml or 1 tsp of essential oil scent. I eyeballed it and figured that was about equal to one eye dropper tube. 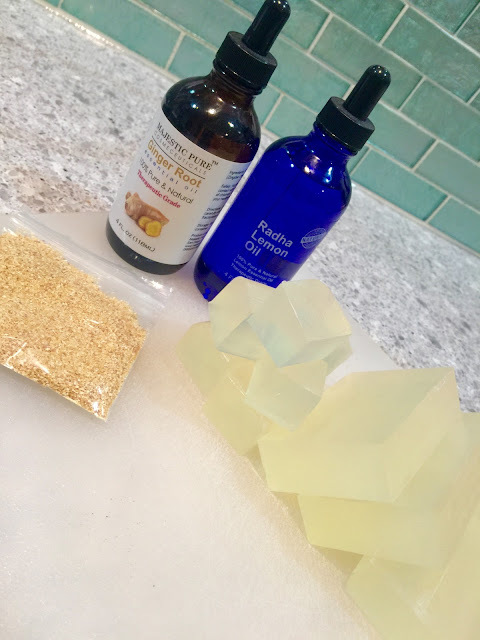 Into the melted olive oil glycerine base, I added half a dropper of ginger essential oil, half a dropper of lemon essential oil, and 1 Tbsp of dried orange peels. It smelled wonderful! I hear that grated lemon zest imparts a wonderfully bright scent to soap but I had the oil on hand and used that this time. This concoction got poured into lightly greased (Pam worked well!! ), molds- in my case, mini bread loaf pans. I used what I had. The second combo came together very similarly. 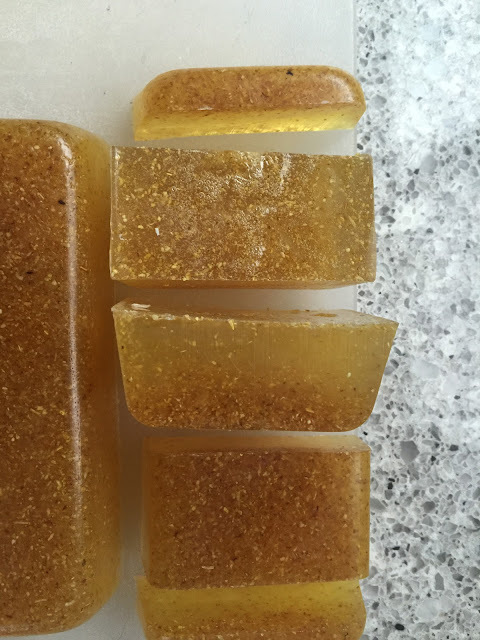 Again, a pound of soap base (oatmeal glycerine this time), half a dropper or rosemary essential oil, half a dropper of lavender essential oil, 1/2 tbsp dried lavender flowers, and 1/2 tbsp dried mixed herbs (rosemary, thyme, and parsley). Fresh herbs shouldn't be used as their water content is just too high. 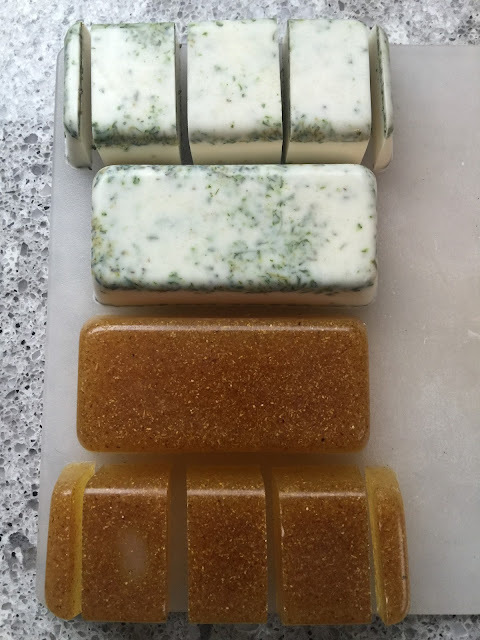 Once the herb and lavender soap was poured, I sprinkled another 1/2 Tbsp each of lavender and herbs on the top of the cooling soap for aesthetics value. 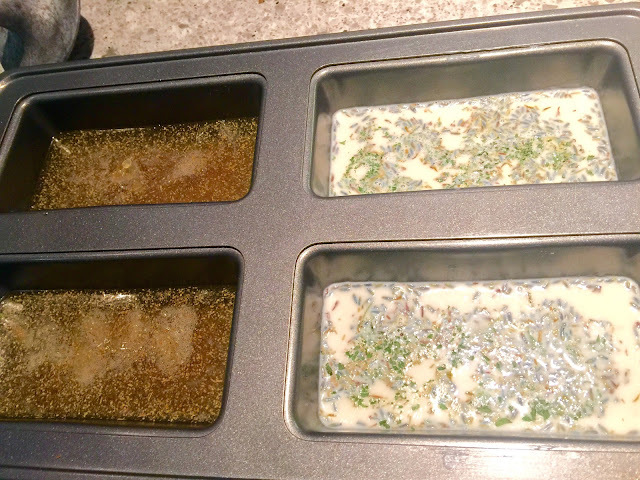 I assumed the majority of the lavender and herbs would sink to the bottom of the mold- and I was right. This was better in my mind but I don't think it made much of a difference in the long run. The whole bar smelled phenomenal. And so began the several hour wait to soap-topia. Tick.tock.tick.tock.tick.... You get the picture. In reality, the time I spent waiting for the soap to harden was a busy few hours. 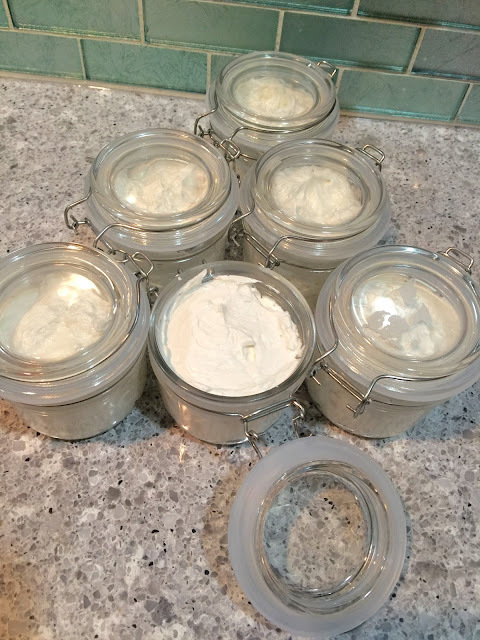 I made an amazingly silky and moisturizing body butter! That recipe is next. Once the soap was cool and hard, I flipped the pan upside down onto a cutting board and lightly pressed on the bottom of each cavity. A sharp knife made chopping the loafs it into smaller bars quite simple. The non-stock spray did its job splendidly. No soap casualties. I decided to wrap up a few of the bars to send out to family. The more testers, the better. 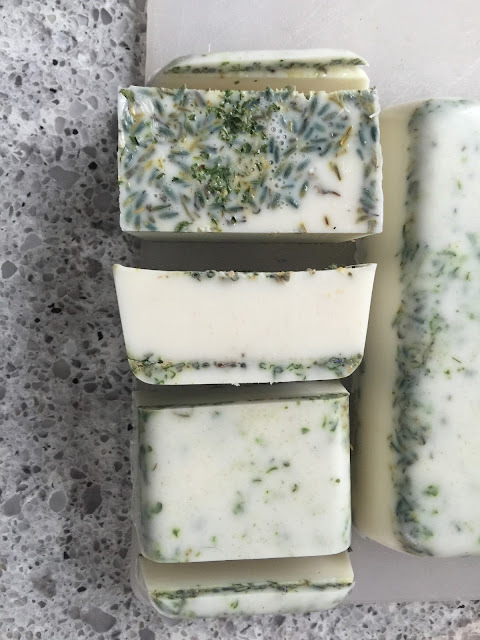 The herb lavender bars smelled like a spring garden. They were exactly what I was hoping for. The citrus ginger isn't a total flop, but the ginger scent isn't nearly as strong as I'd like. It still smells good, and the exfoliating orange peels feel wonderful regardless. 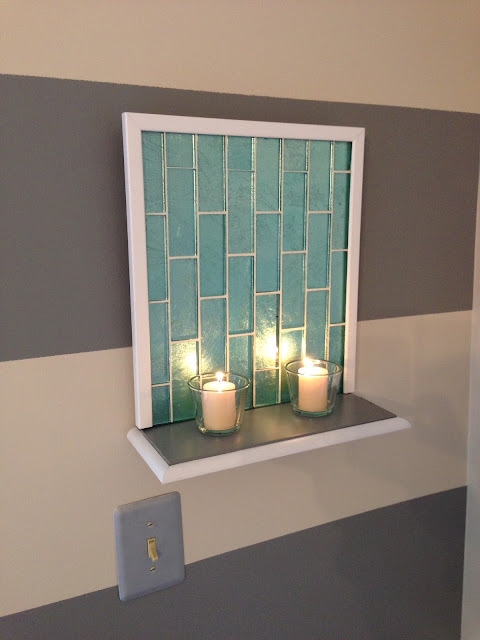 A thin strip of velum paper, colored twine, and tag turns these nice bars into something gorgeous. Onto the Body Butter. 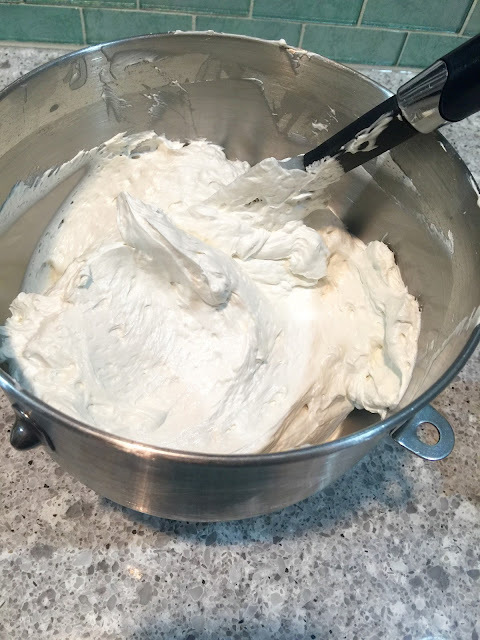 Have you ever looked at a bowl of buttercream icing and thought- oh man I bet that feels wonderful on skin. If you did, you'd be wrong. It's sticky. But the light whipped clouds are enticing anyway! 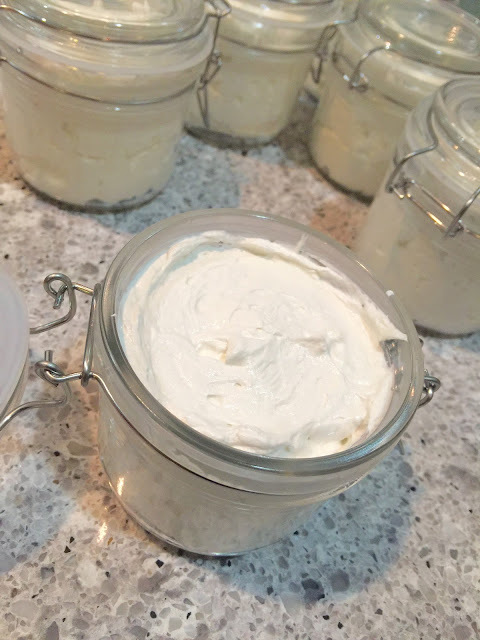 Enter whipped shea body butter. 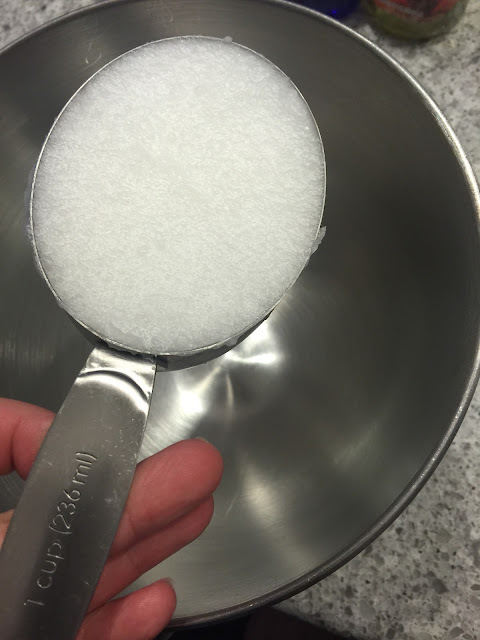 It's silky, light, and melts the second it touches skin. It goes on a tad oily but soaks in and leaves behind a soft, moisturized, and surprisingly non-greasy finish. A little goes a very long way though- this is your standard lotion taken to an entirely new level. 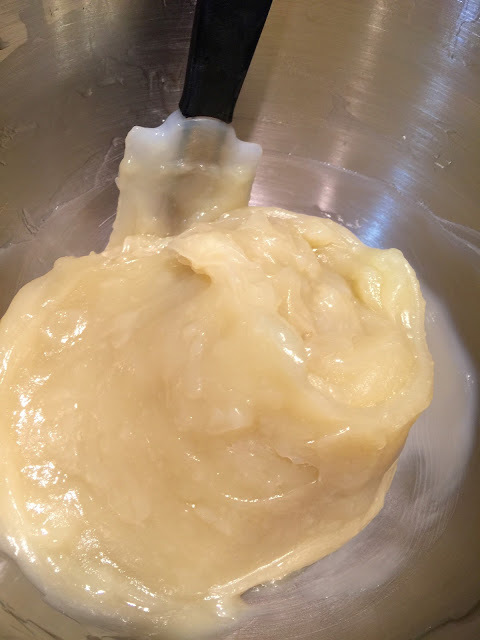 You'll need a stand mixer with whip attachment, raw shea butter, coconut oil (the hard variety for cooking), grapeseed oil, and a scent of your choice. 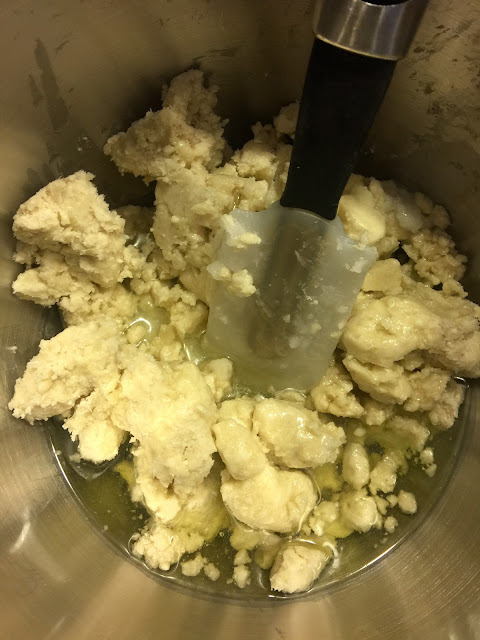 Raw shea butter smells a bit strange if you aren't accustomed to it, looks hard, feels like dry clay, and seems like a major failure destined to happen. This works. In the bowl of your stand mixer, put 1 cup coconut oil, and 2 cups (roughly 1 pound) raw Shea butter. Set the bowl over a pot of lightly simmering water for a makeshift double boiler. I'm all about using less dishes wherever possible. Gently stir as everything melts. 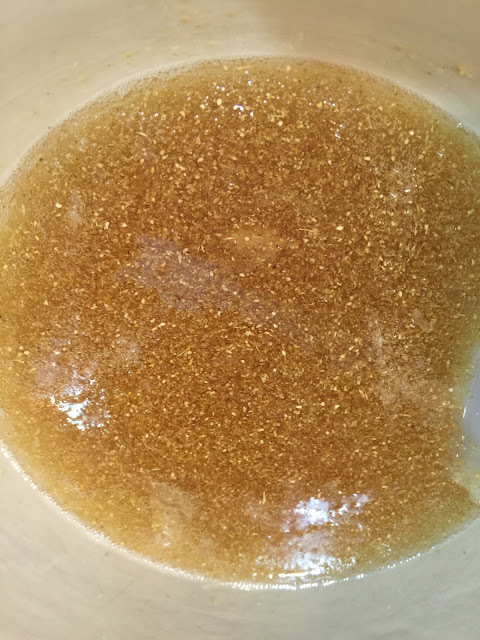 Once melted, stir in 1/2 cup grapeseed oil. Set this aside for 30 minutes to let it come down in temperature a bit. Once the bowl is no longer hot- warm is fine- set it over a bowl of ice water to speed the cooling. At this point stir in your scent of your choice. Essential oils work well here but keep them to a minimum. You don't want to smell too strongly after you apply this. If you were to whip this in its liquid state, you would have a bowl of liquid and likely a mess on any surface within 15 feet of your mixer. If you whip it once it's cool, you get body butter. 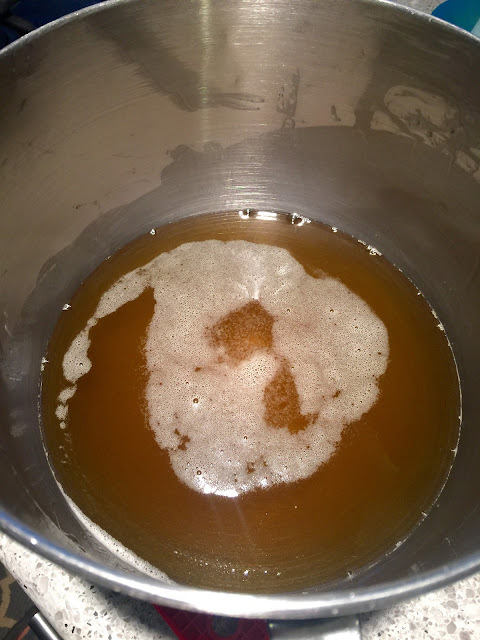 This is what is looks like after cooling. Think cream of chicken soup- no seriously. 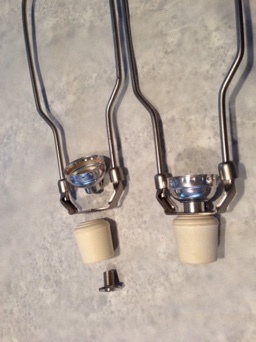 Pop the bowl onto your stand mixer. 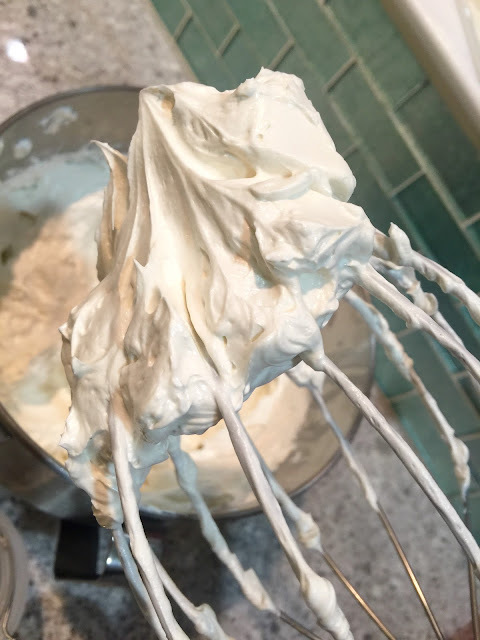 Using the whip attachment, beat on medium until it looks like buttercream. Scrape the bowl a couple of times to make sure everything is fully incorporated. 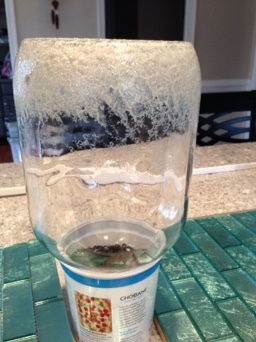 From here, simply pack it into glass jars and store in a cool place. It will last 3-6 months. This recipe makes roughly 7 cups of body butter and can easily be halved or quartered to meet your needs. So the next time you plan on saving your good towels, or good soap, or whatever- don't. Use it up. Enjoy them. You deserve it! What good are they as just pretty ornaments on a counter anyway? 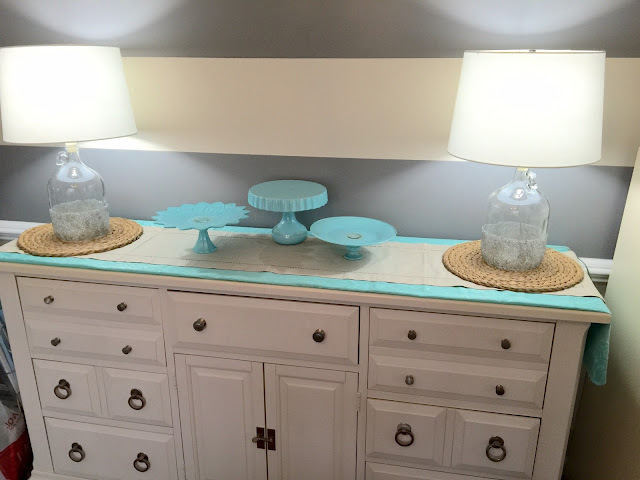 This is the buffet in my dining room- see those awesome lamps? I made those!!! 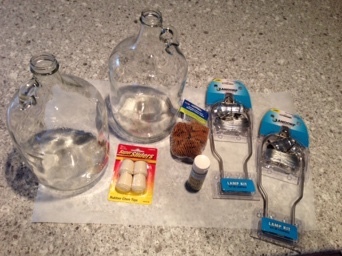 *2 glass carboys or wide bottom jugs of your choice. I picked mine up on Amazon pretty cheaply as I couldn't find exactly what I wanted in any local 2nd hand shop. 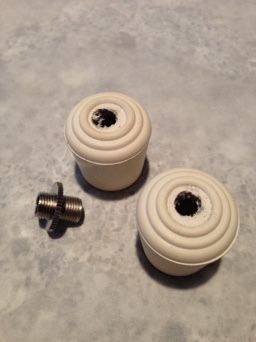 *2 rubber caps for the bottom of chair legs. You may use corks in place of these but regardless- test for to make sure they are the right size. 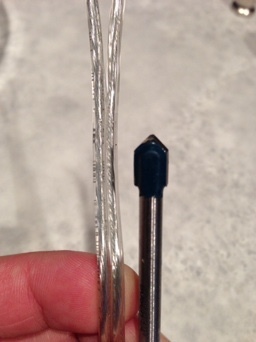 *A 1/4" glass drilling bit. 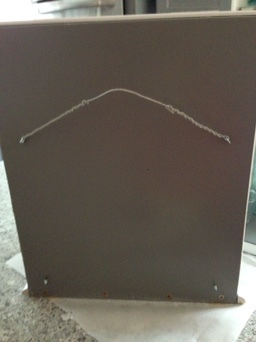 The hole just has to be large enough to pass the bare wire through. Optional- paint and a brush or sponge to apply. 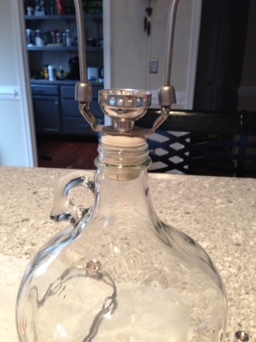 First- drill your hole near the bottom back of the Carboy. 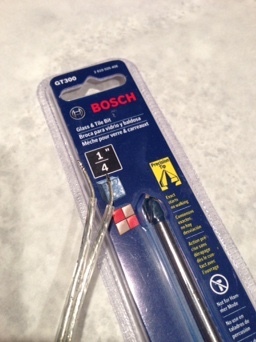 I wore safety glasses and followed the directions that came with my bit. It was super simple. 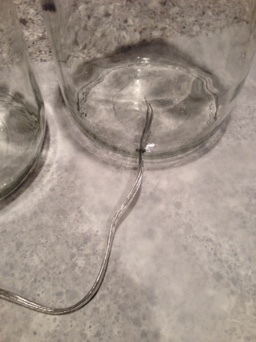 Then pass the bare wire from your lamp kit through the hole to make sure it fits. 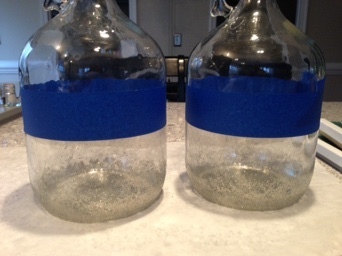 Next I cleaned the carboys and painted. 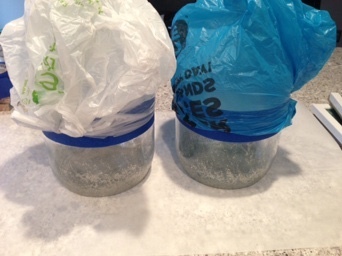 I removed the wire and set the jugs upside down in large plastic yogurt containers of dried beans for weight. This kept them from toppling over and worked really well. My original grand plan was to do an awesome glitter ombré from the bottom and fading it to nothing near the halfway point. Spoiler alert- that looked like crap once dry. The glitter part looked amazing and the color of glitter was spot on! 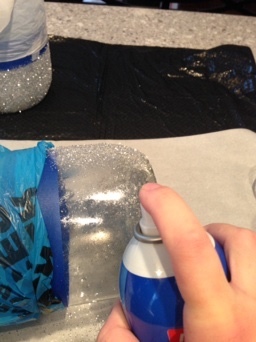 But the clear glue that holds the glitter down made the glass look wavy. Not a fan... So here's that mess up. Keep reading, I fixed it. To fix it, I put painters tape just above the top of my failed ombré. Then I taped plastic bags over the clear part that wasn't going to be glittered. 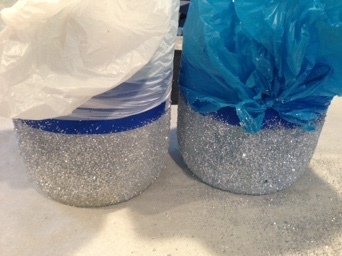 The goal this time was to cover the bottom parts of the jugs in a heavy duty spray adhesive and douse them with glitter. I had only bought one small bottle of the paint and it was now half gone. 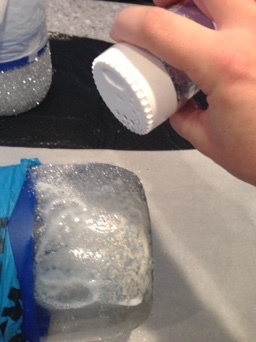 However, I did have a ton of silver glitter in the arts and crafts closet. 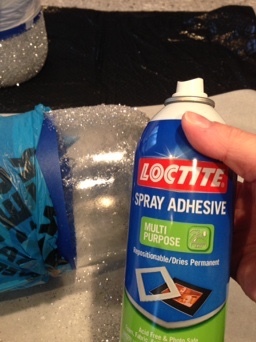 Here's the adhesive I used. This stuff is STICKY! 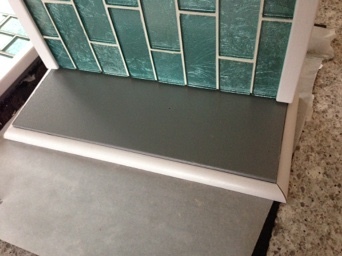 Cover anything within a 4' radius in washable or throwawayable material. I was extremely glad I thought ahead enough to cover the tops in plastic. It was necessary. ... And then sprinkle. Easy peasy. Repeat until you get all the way around. Then I took my sponge and sponged on the rest of that cool glitter paint which gave them a cool antique-y look and took down the disco ball feel a bit. The jar with the white bag is after the paint, the blue bagged jar is before the antique-y paint. These are my rubber chair feet protectors. 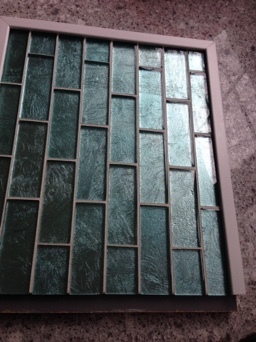 I found the piece that needed to be shoved in them and drilled a hole slightly smaller than that. 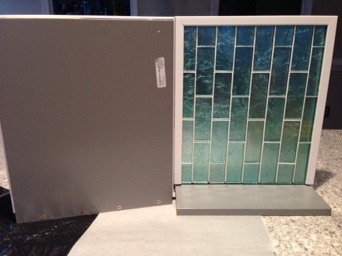 Here's how they went together. 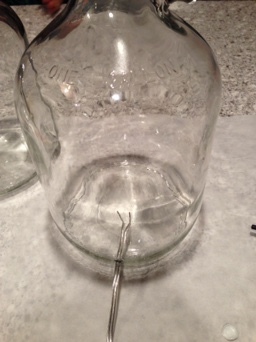 The stopper sits snugly in the jar without slipping through. The wiring part I'll leave to the instructions in your kit. I'm sure they vary a bit and I don't want to be responsible for someone's electrical fire. My lamps have been going for a year and I adore them. 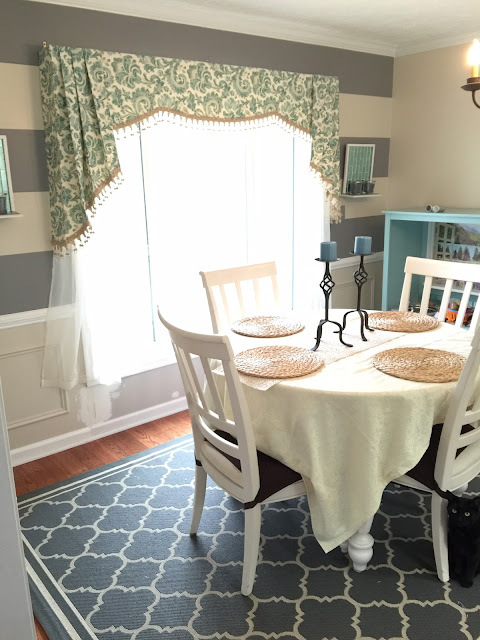 I painted the dining room to match the adjoining kitchen. 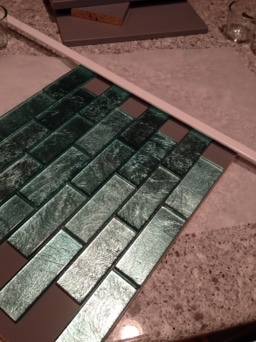 When I finished tiling the backsplash, I had a bit of tile leftover. 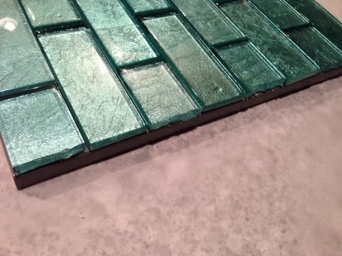 I wanted to carry it into the dining room since I loved it so much. I throught about framing some and hanging it but wasn't a fan when I actually tried it. 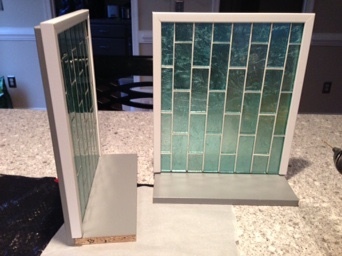 So I went with a pair of sconces. 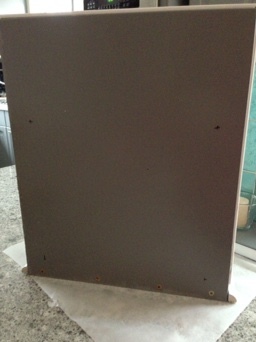 I used a leftoverside cabinet panel and kick board from redoing the kitchen. The only other thing I needed was the corner bead. 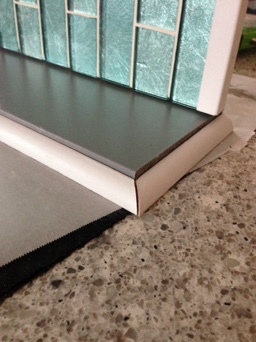 After doing the backsplash in the kitchen I realized I needed to cover the edges- this worked perfectly. 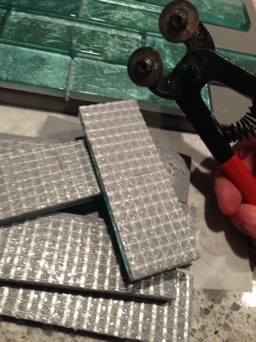 I grabbed my trusty tile nippers and chewed through the tiles that had an overhang. The edges actually came out fairly straight this time. 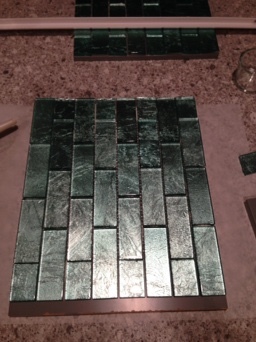 So I laid the tiles out and trimmed the board to fit the tiles. 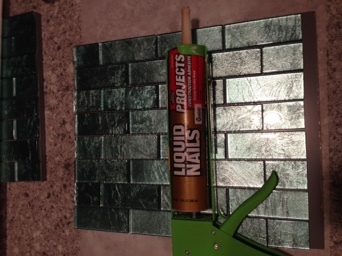 Everything got a thick layer of liquid nails to keep it down. 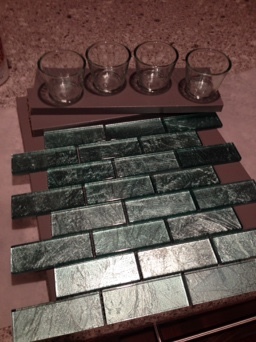 The lip at the bottom is for the candle shelf. screwing the candle shelf on took 5 very carefully measured screws. 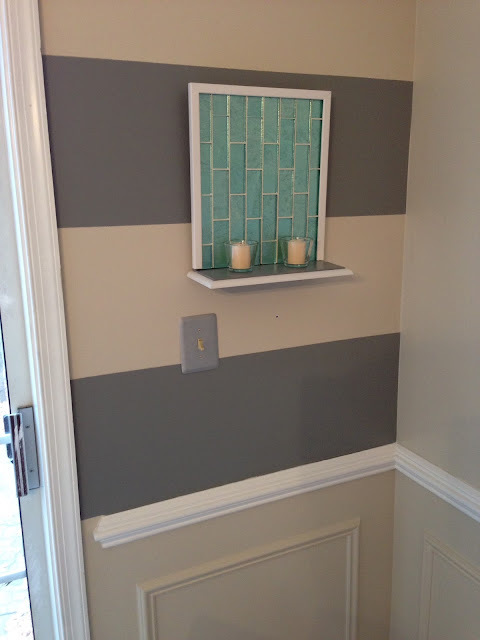 I had extra 1/4 round from finishing the floor trim so I added that to the front and sides of the shelf to finish it. 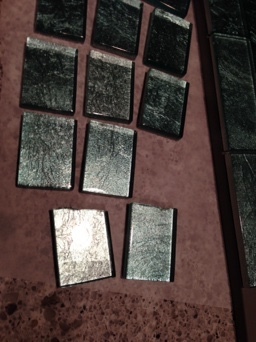 Any raw edges of the gray pieces were painted with matching paint. I used 2 small screw eyes and heavy picture wire to hang these. 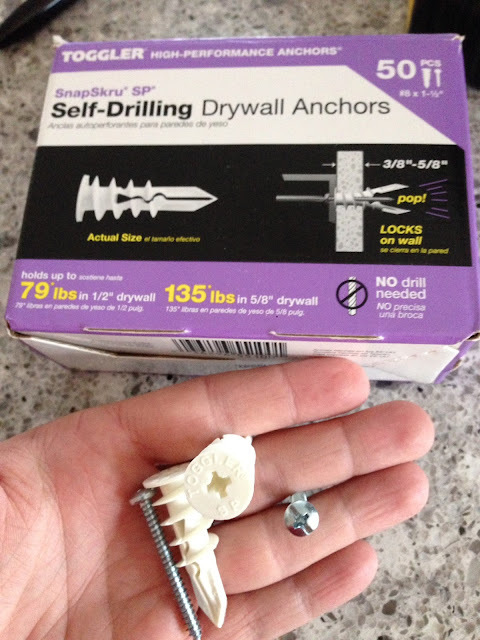 The drywall anchors used are meant to hold a lot more weight than these sconces- which made me feel safe hanging them.